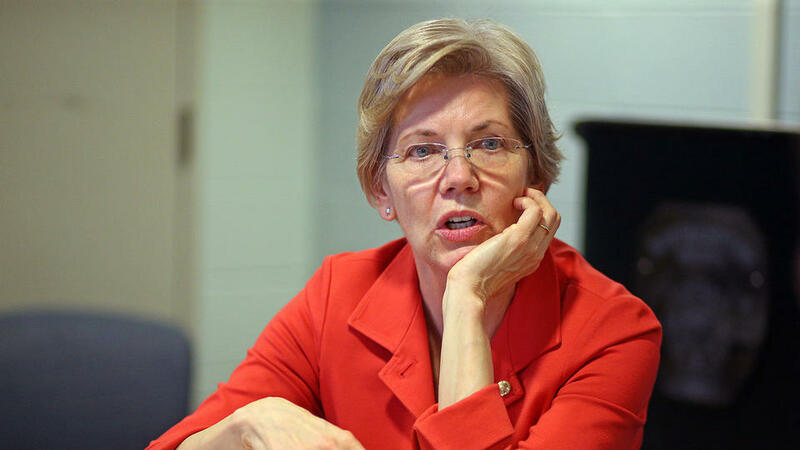 Sen. Elizabeth Warren (D-Ain’t Sayin’) is unquestionably a political force on the national scene. 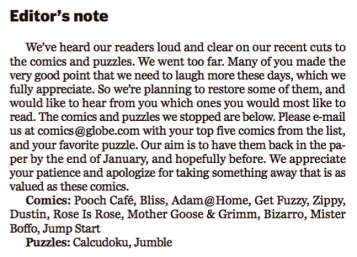 But now she’s a comic book “Force” as well, although that means very different things in today’s Boston dailies. Nice little promo for the book and the senior senator. 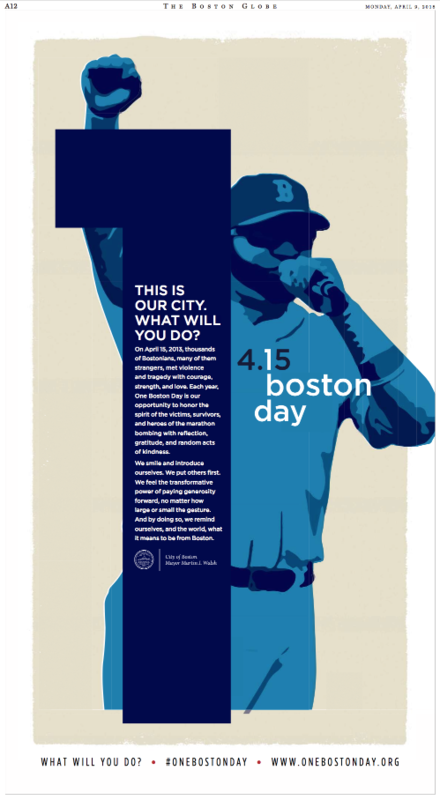 Crosstown at the Boston Herald, columnist Howe Carrtoon mails in – predictably – a very different take, which you can read if you like, although we don’t recommend it. Liz and let Liz, eh? The local dailies are giving a whole new meaning to the Warren Report. 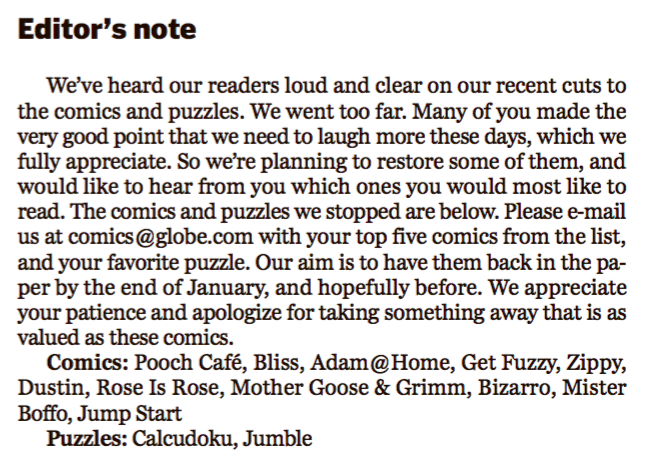 Yesterday’s Boston Globe was a Love Letter to Liz (actually a mash note, not to get technical about it). The paper devoted over 25% of its Ideas section to making a Warren for President case, starting with this rare front-page editorial. That’s a lotta real estate for Warren to gobble up. 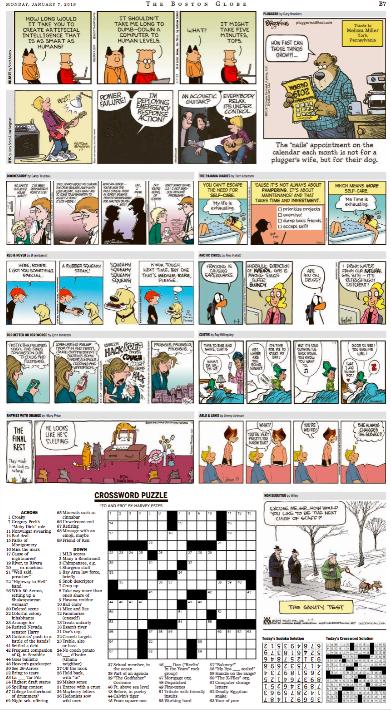 Not to be left home from the dance, the Boston Herald jumped on the Lizwagon today. 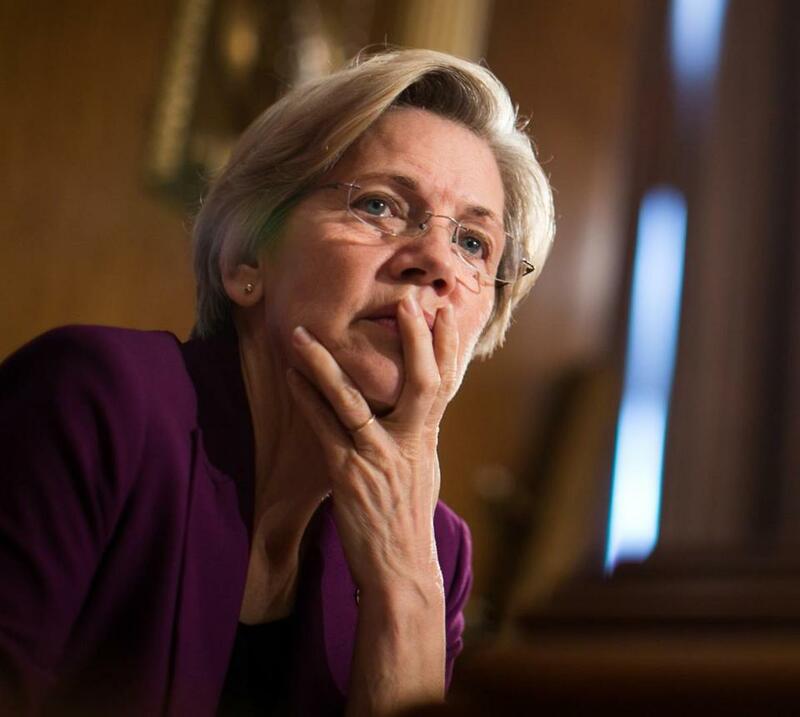 WASHINGTON — Elizabeth Warren, as we now know her, would make a terrible presidential candidate. But her party, the Democrats — including presumptive nominee Hillary Clinton ­— need Elizabeth Warren to run. Because they need a primary, and no one else can give them one. 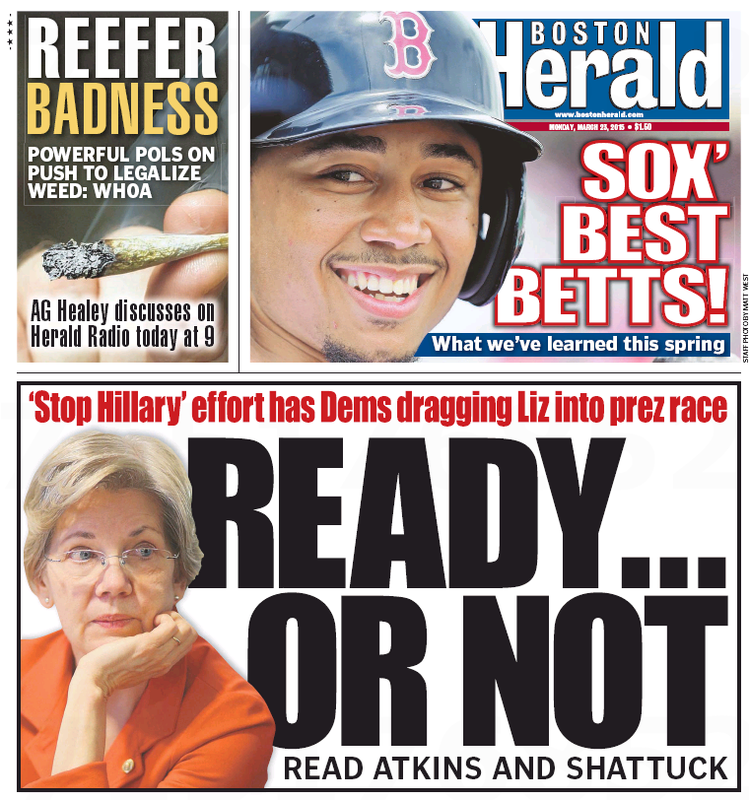 The Herald’s Tom Shattuck is even more desperate for a Warren run. Please, please, PLEASE! Go for it! 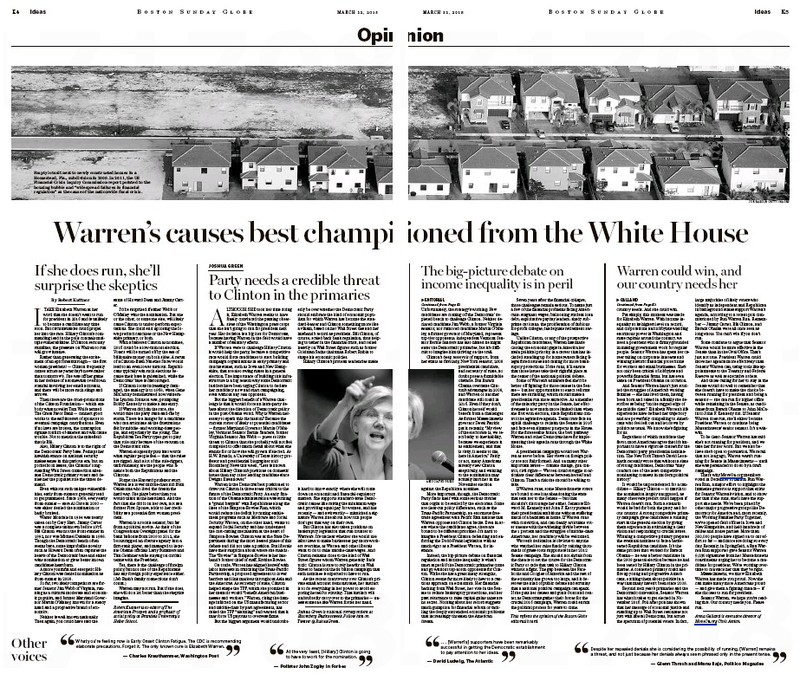 Funny – the Globe wants a Warren run to help Hillary Clinton, while the Herald wants one to hurt her. The feisty local tabloid has a hill-acious dislike of Hillary Rodham Clinton, with today’s edition serving as Exhibit Umpteen. Start with the page 2 column by the always unreadable Adriana Cohen, who rattles on about salary inequality in both the Obama White House and Clinton’s training-wheels-up presidential campaign. Now flash forward to today — she’s reportedly given the top jobs, and salaries, on her exploratory presidential campaign staff to men. Back when she was a U.S. senator for New York, reports are now surfacing that she paid women on her staff only 72 cents to a man’s dollar. Proof she’s no champion of women. Next page, Tom Shattuck’s column about a softball interview with Elizabeth Warren on MSNBC’s “Morning Joe.” Into the middle of his rant (he called MSNBC “America’s most shamelessly partisan cable ‘news’ channel” – didn’t he read this? ), Shattuck drops an H-bomb. All anyone really cared about Warren this week wasn’t the middle-class hammering thing. Monday was the day the hated conservative genius Karl Rove’s video went viral — brilliantly using Warren’s own words, in her own voice, in a video to hammer Hillary Clinton. Moving along in our madcap review, say hello to Joe Fitzgerald, who serves up some Clinton evergreens. 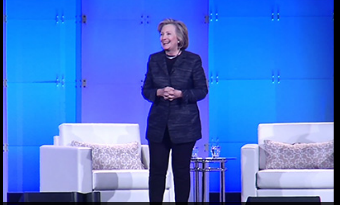 Are you, too, tired of looking at Hillary Clinton? It infuriates her when anyone suggests she rode her husband’s coattails to prominence, but who was she before Bill’s star began to rise? Indignantly assuring us she was “no Tammy Wynette, standing by her man” when it was revealed her man was a lecher, she raged against a “vast right-wing conspiracy” for making his philandering public. 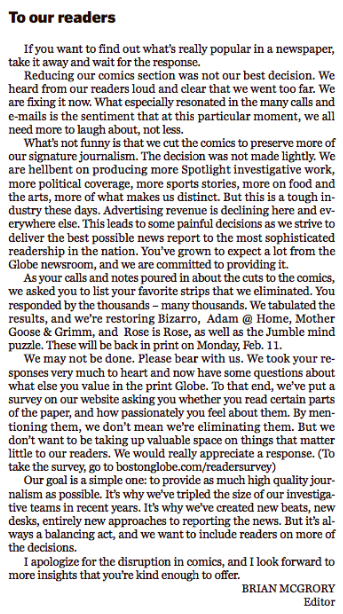 Next up: Jonah Goldberg’s syndicated column on the op-ed page. After decades of public life, even Clinton doesn’t really know who she is — or at least who she should be this time around. But the Herald sure does.